A copious amount of goodness in a flash. Juicy cooked ham is mixed with lots of fresh crunchy vegetables with an all out taste-bud party-gras. Capers and giardinera provide the acidic tang, while celery and mandarin contribute crisp texture and sutle blast of sweetness. 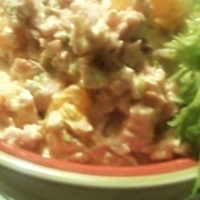 Guaranteed to become your new favorite go-to ham salad for quick meals or maybe the next potluck, picnic or tailgate!!! This recipe is great for leftover ham from a holiday or dinner! Place ham, celery, onion, giardinera, capers and salt and pepper to taste in food processor. Pulse until roughly chopped and blended. In mixing bowl, combine mayo, mustard, sriracha and honey until well blended. Pour in contents of food processor and fold together until evenly coated. Fold in mandarin. Chill before serving. Great with crackers, pitas, naan, toasted or plain bread, sub rolls, etc.... . . This salad can be whittled of fat and calories simply by using either a lower fat mayo or substituting greek yogurt for the mayo altogether. You may also use half and half (1/4 c. mayo, 1/4 c. greek yogurt) to keep the taste along the original lines.